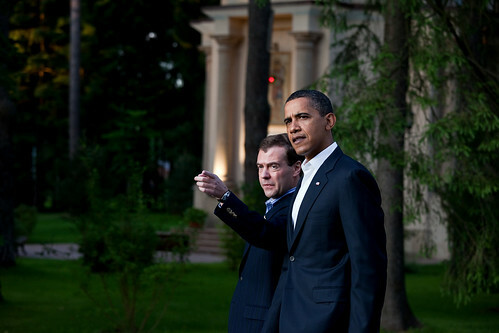 President Obama with Russian President Dmitry Medvedev at the latter’s dacha outside Moscow. At least the document acknowledges that this policy is going to be a problem down the road—and not far down the road, at that. It states that maintaining strategic stability with Russia and China is going to be difficult since both “are claiming [emphasis added] U.S. missile defense and conventionally-armed missile programs are destabilizing.” Of course, you might argue that if Russia and China believe these programs are destabilizing and react accordingly, they are destabilizing—even if the United States thinks they shouldn’t be. According to the NPR, the United States will explain to Russia “that our missile defenses and any future U.S. conventionally-armed long-range ballistic missile systems are designed [emphasis added] to address newly emerging regional threats, and are not intended [emphasis added] to affect the strategic balance with Russia.” I’m not so sure that will persuade the Russian military. After all, the U.S. military is fond of saying that capabilities—not intentions—are what matter most. Of course, what really matters when talking about potential threats to nuclear arsenals is perceptions of capabilities rather than actual capabilities. As long as the United States and Russia have a deterrent relationship, Russia will be concerned about U.S. capabilities to destroy Russia’s nuclear weapons in an initial attack and to defend against them in a counterattack. Russia might worry that U.S. long-range missiles are accurate enough that even a conventionally-armed one could destroy a Russian silo, and that U.S. satellite-based observation capabilities are good enough that a conventional long-range missile could target Russian mobile missiles. It might also believe U.S. missile defenses could destroy any residual missiles Russia could launch. So perhaps the United States will try to explain to Russia that US missile defenses will have no real capability against Russia’s nuclear-armed long-range missiles—as is highly likely. But that is a hard case to make while at the same time arguing that the Aegis sea-based missile defense system will be effective against medium range missiles, and while the United States is planning to build faster interceptors to boot. And the case is harder to make the smaller Russia’s arsenal is. According to the NPR, the United States is planning to discuss missile defense cooperation with Russia, including “integrating U.S. and Russian sensors, developing joint missile defense architectures, and conducting joint testing, research and development, modeling and simulations, and exercises.” If this cooperation includes all U.S. missile defenses against long-range missiles, it would provide Russia will a good understanding of the capability of these systems and may help minimize its concerns about U.S. missile defenses. Perhaps a U.S.-Sino exchange of views is the best that can be achieved. If it is hard to convince Russia that it shouldn’t find defenses and long-range strike destabilizing, it will be much harder to convince China since it has a much smaller arsenal of long-range nuclear-armed missiles. Moreover, any U.S.-Russian cooperation on missile defenses will almost certainly be viewed as a threat by China. UCS has been pointing out for decades that as long as the United States maintains a deterrent relationship with Russia and China, the U.S. deployment of defenses that these two nations believe are capable against long-range missiles will make deep reductions in nuclear arsenals much harder to attain. It’s not clear that any amount of explaining will change that.